Asphalt – the material of which blacktop driveways consist – tends to be more flexible than concrete. On very hot days, it can become soft. That doesn’t matter for us human folk. We can walk on it without it sinking in (although it’s not recommended you test this hypothesis in your bare feet). The problem occurs when you leave your car parked in the same spot summer after summer. Over the years, you’ll notice a dent in your driveway. Betsy had already left for the office when the call came. It wasn’t a quick call, but it was very productive. I didn’t suspect a thing. The lake effect furies fling their fluffy flurries in a fickle manner. They come when you least expect it. Such as the day when I received that call. Miss Powell ain’t got nothin’ on Charles Schultz. I’m older now. Mother Goose’s feathers don’t fascinate – or distract – me as they once did. I glanced outside the window for a moment as I tended the telephone, then seamlessly returned to the call. It was no big deal. With the call ended, I put on my winter coat and my boots. I slung the strap of my laptop case around my shoulder and headed out the door. As I approached the garage door, I have to admit, I was impressed by the amount of snow that fell during that short period I was on the phone. It blanketed the driveway. Betsy had left not long before, yet, such was the thoroughness of this particular band of lake effect snow that I could see no evidence that her car was only moments before parked on the driveway. As if navigating a mine field, I stepped carefully, trying my best to avoid those dreaded driveway dents. They were now deep enough to cause you to lose your footing. I decided a path smack dab through the middle of where Betsy parked offered the safest route to my waiting car. In the flash of a moment, the ground failed to resist my boot. As my foot fell into the hole it touched the ice. I was going down. Conceding there was no way to regain my balance, I merely tried to control my fall. My modest object: protect the two most important things in my possession – my head and my laptop. All else could be sacrificed. I oriented my fall so my right knee would take both the initial hit and the full brunt of the fall, leaving my head far above the fray (namely, the rock-solid driveway). This was my priority, my primary goal. Simultaneously, my left arm took care of the secondary goal. As gravity pulled the weight of my body crashing to the Earth, my left arm lifted the laptop case in the opposite direction. Sure, it was destined to land on the ground somewhere, but my arm positioned the device to make that landing as soft as the snow it would soon hit. I achieved my objective. My head never hit anything, and the computer’s landing approach was as smooth as that of an airplane as it slid down my arm. But, oh, did my knee hurt. I feared I smashed it. So intense was the pain that I lay motionless for a minute or so. I slowly stood up, testing its strength. I teased myself for an instant about going back into the house and calling it a day. It was a Friday, so that would have been an easy call. But, being raised to play through the pain, I instead hopped into my car and headed to work. Besides, I had a lunch meeting that day. By lunchtime, my right knee felt like nothing had happened. It was great. My left wrist, on the other hand, well, that was another story. Funny thing. I don’t remember hitting my left hand at all. It obviously must have hit, because I knew my arm acted as a brace for the computer. But it didn’t hurt when it hit. Now it did. One of the guys at lunch, a basketball veteran, took a quick look, determined it was swelling up, and told me to put it on ice and wrap it in a bandage. Me, being a typical guy, went back to work. I told myself I’d see how it felt on the weekend. I didn’t have to type as I had already met my Sunday, Monday, and Tuesday deadlines. The weekend proved only minor comfort. By Monday morning, with new deadlines looming, I threw the towel in. And by “throwing the towel in,” I mean I called the doctor. Could it be, for the first time in my life, I had broken a bone? Doc proceeded to bend everything. No pain. Finally, he asked me, “Where exactly did it hurt?” I show him. He bent that part of my wrist. In the end, the X-rays showed no break, just a pretty severe sprain. 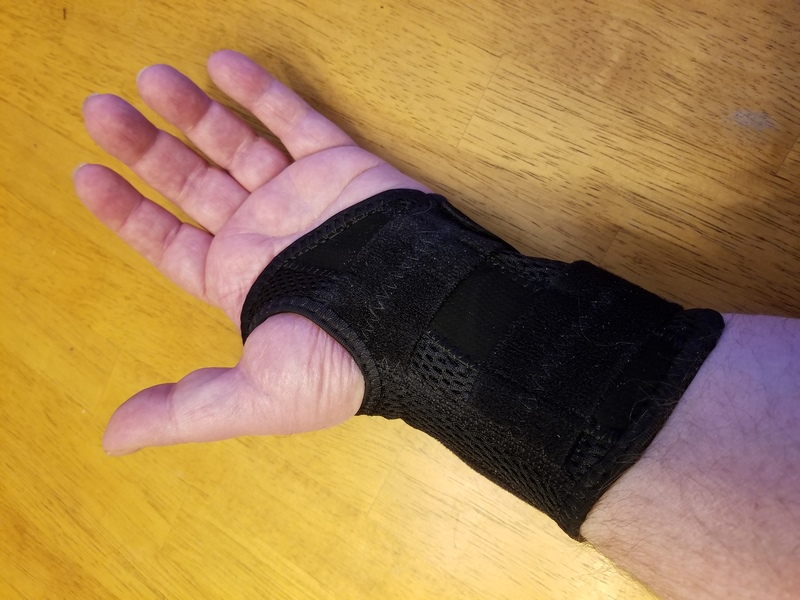 I have to wear a brace for a couple of weeks. 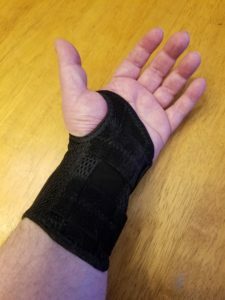 Have you ever tried to type with a bulky wrist brace? I’m starting to have second thoughts about concrete driveways. After all, they are a family tradition.